Kava, also called “grog” or “yaqona” in Fiji, is a drink made from the crushed or powdered root of a member of the pepper family that has been carefully and ceremoniously mixed with water. Originally the mixture was strained through a bundle of hibiscus fibre after being prepared in wooden bowls which were used solely for the purpose of mixing kava. The final result is a liquid roughly the colour of a muddy puddle that slightly numbs the tongues of those who drink it. Important to men and women in ceremonies across the islands, legend says that the tradition began in Tonga where the plant sprung from the grave of a princess who died of a broken heart. In today’s festivities, the mixing and drinking of kava is a form of welcome to guests and visitors and follows a give-and-take ceremony in which everyone participates. Commonly the highest-ranking chief is first to drink, opening the ceremony, and when offered to guests it is the custom to clap loudly, shout “bula!”, clap once more, drink the kava-filled coconut shell in one gulp and clap three times to signify the turn is passed to the next person. While there are slight differences in some ceremonies, this is the most common kava-drinking ritual. The kava ceremony not only brings families together but is a fantastic unifier on a greater social level, commonly leading to open, relaxed conversation amongst all present and breaking down any barriers between participants. 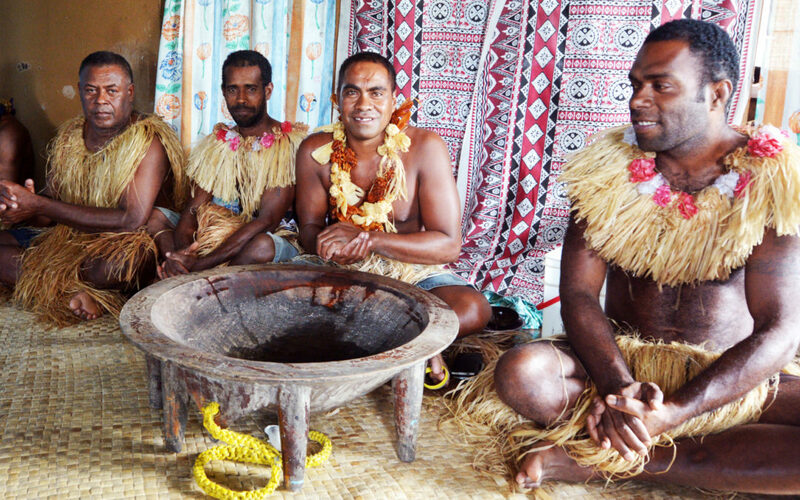 Get in touch with the My Fiji Holiday Experts for more information on kava ceremonies and how to get involved when you visit Fiji.